Arrive preened and polished for the party season in our tea rose pink birthday gown. Exclusively yours, this pastel dress is the definition of luxury and promises to deliver elegance in an instant. Whether your little one has a birthday or a family celebration on the cards, this girly gown is sure to exceed expectations. 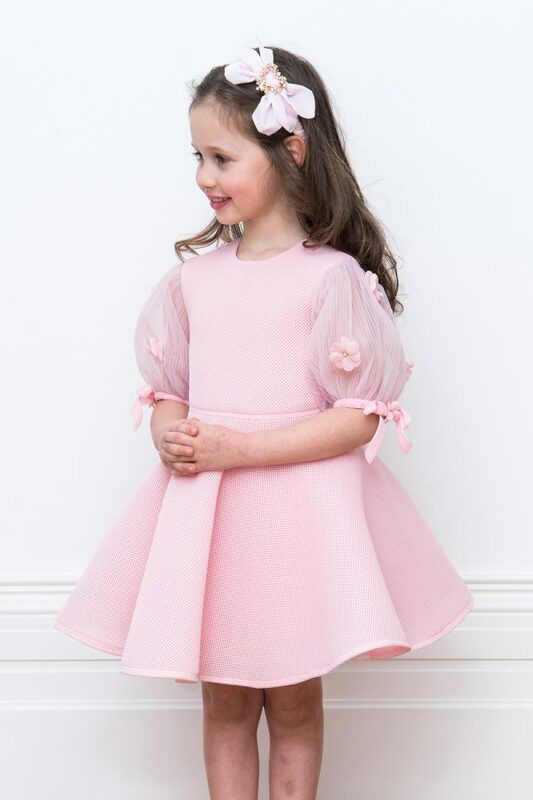 Available in a pretty tea rose pink colourway and a soft skater silhouette to showcase an on-trend occasion look, your sweetheart will be all smiles as she embraces her next event in this signature designer dress. With balloon-hem sleeves that boast floral applique accents and a matching ribbon trim, this is the ultimate statement dress for girls in need of a pastel coloured outfit. Concealed zip to fasten. Height of Model : 43 3/4″ – 111cm – wearing age 4 years.